I always steam cook vegetables to make curries (poriyal/sabji). Fried curries are a rarity. Just because it would take lot of time to cook and use a good amount of fat inducing oil/butter! 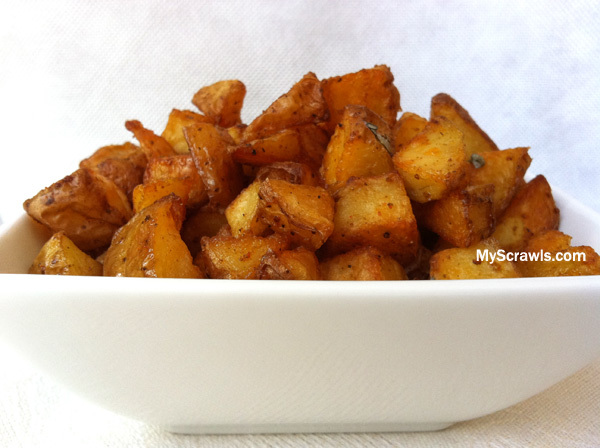 Can you think of potato fry with very less oil (or butter)?? I bet you can! Want a clue? Bake them This oven baked potato fry recipe needs just 5-6 tsps (even dessert spoon would work) of cooking oil for 7-8 medium sized potatoes (not the big Idaho / tiny baby potatoes). Honestly I didn’t find any difference in taste or flavor from the deep (oil) fried ones. The total preparation time is less than 5 mins (excluding cutting veggie) and cook time is about 45 mins. Don’t worry you need not stand near the stove and keep on stirring the curry. Just put the potatoes in oven and relax! 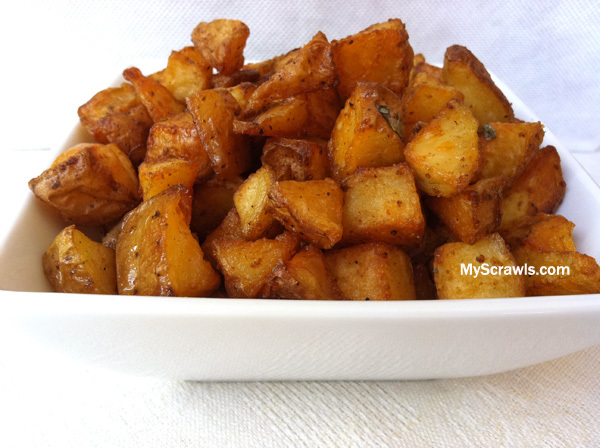 Note: Adjust the amount of salt, garam masala, chilli powder and pepper powder as per your taste to enjoy spicy potato roast. Meanwhile wash and clean potatoes. Cut into bite sized cubes. In a large bowl, combine oil, salt, garam masala, chilli powder, hing, curry leaves and pepper powder. Add potatoes and toss until coated in oil mixture. Arrange oil dipped potatoes in single layer in a baking tray. Place in the oven and roast for 30 minutes. 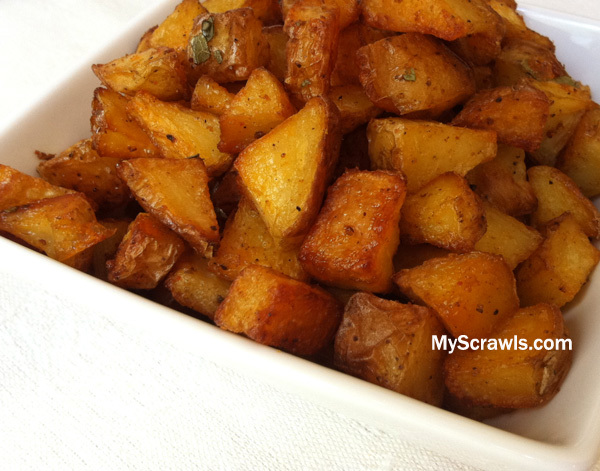 Allow potatoes to roast till they become lightly brown for 15 minutes. Remove from oven and serve hot/warm. Note: While roasting potatoes in oven, make sure to take it out every 12-15 minutes and toss the potatoes. This will ensure roasting evenly on all sides. Looks so delicious and perfect !! Hope you can store it for the Winter! Thanks for the recipe. Its easy to make and turned out wonderful!